Background: Breast Cancer Navigator (BCN) programs are considered best practice in cancer care, using the Commission on Cancer Standard 3.1. The diagnosis of breast cancer is often accompanied by extreme distress. Studies to date on the BCN intervention have primarily examined screening practices, cost measures, or downstream effects on care. Objective: Few primary studies have examined the effect of early intervention by a Breast Navigator Nurse program on distress. We tested the effects of an early intervention by the BCN on distress. A secondary interest was how an early intervention might change practices. Methods: A convenience sample of newly diagnosed breast cancer patients was recruited for a descriptive, quantitative pilot study, incorporating anecdotal commentary. Constructs from Hildegard Peplau’s Theory of Interpersonal Relations and the Social Ecological Model were adapted to the Johnson Bongiorno Model to guide the study. 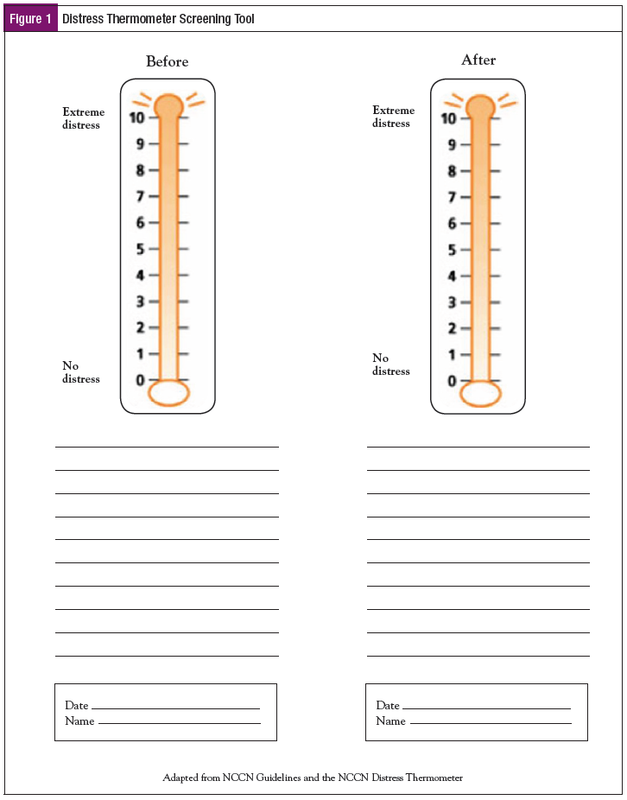 Distress levels were collected immediately pre- and postintervention, using the Distress Thermometer. A paired samples test was conducted to examine distress before and after the BCN intervention. Results: There was a statistically significant difference in scores between preintervention distress (M = 7.44; SD = 2.68) and postintervention distress (M = 2.94; SD = 1.86) conditions t (8) = 8.27 p-0.00. Effect size was calculated, with a Cohen’s d of 1.79. Conclusion: Findings suggest that the BCN intervention reduces distress in this population, although the sample size was small. This study helped to drive practice changes at the institution, allowing the BCN to intervene shortly after the diagnosis is delivered. There was a significant increase in the number of patients choosing to stay with care at the institution. The 2012 American College of Surgeons (ACS) Commission on Cancer (CoC) Standard 3.1 Patient Navigation Process1 was a driving force behind the implementation of oncology navigator programs in many institutions as it phased into effect in 2015. An oncology care coordinator/breast care navigator (BCN) position was created at this rural northeastern ACS-certified community cancer program to address the standard and the essentials of care for breast cancer patients. The oncology navigator role is still evolving and lacks standardization, as the work focus is determined by a triennial community needs assessment and the individual needs of the patient,1 but the goal is universal: analyze the systemic and individual cancer care pathways and remove real or perceived barriers to care. The BCN is a pivotal figure in the upstream process of managing coordinated cancer care. Each year in the institution of study, approximately 100 patients are diagnosed with breast cancer. Most experience this as a first diagnosis with cancer, but a few are diagnosed with metastatic disease or a second primary site. The standard of care for delivering test results is for the reading radiologist or the ordering physician to contact a patient by telephone. This is often when a patient is at home alone or conversely in a public place. The wait for the next professional discussion at the surgical consult may be as long as 5 days, and the patient’s distress in the interim can be overwhelming. Self-report by patients to the current BCN corroborates this experience. Patients are left with few resources and remember only the shock of a grave diagnosis. The ensuing distress leads patients to learn about breast cancer from any resource they can find, as they await the surgical consult. This information may not be valid, reliable, or appropriate to their situation and can increase their distress. The BCN is an excellent patient resource, but the BCN program is only available by referral from the surgical office, or by word of mouth. The diagnosis of breast cancer is often accompanied by emotional distress of body image disturbance and alteration in sexuality.2 Patients seen for a postsurgical consult by the BCN are offered emotional support, education on the diagnosis, discussion related to treatment options, and appropriate referrals are made. Our BCN visit offers a safe, nonthreatening environment to discuss these important emotional issues, as well as to address care coordination and physical concerns. A second CoC standard, 3.2 Patient Distress Screening,1 requires a measurement of patient distress at a “pivotal” medical visit, with appropriate referrals based on the level of distress and individual need. We determined it was important to capture the effect of the early intervention of the breast navigation visit on that distress and used a validated tool to measure distress (Figure 1).3 The CoC requirement for distress screening gave us the impetus and tool to measure this life-altering distress. One case-based study determined how a specific teamwork method improved care coordination, but the pivotal role of the navigator was not specifically addressed.8 In another study, the use of lay navigators in medically underserved areas showed improved rates of early screening and a reduction in disparity of access to care.9 Lay navigators were also found to be effective in reducing stress in elders with cancer, as well as in improving healthcare system utilization.10 One qualitative study examined the paired perspectives of patient navigation.11 Important findings included that although the patient/navigator dyad reported that information and responsive support were important, only navigators were able to identify the importance of the emotional needs of the patient during early care. It was only after completion of the BCN relationship that patients were able to reflect back on the importance of the emotional support provided by the navigator. Shortly after Standard 3.1 Patient Navigation Process was published, a BCN intervention reported significantly improved self-efficacy, support for unmet needs, and positive effects on psychological needs in their sample.12 This study also examined care choices for patients in rural areas, where patients were less likely to make a provider change than those in urban areas. This is of interest, because the effect of BCN interventions on improved support may also have affected provider and care choice decisions. Newly diagnosed patients with breast cancer relate enormous amounts of distress. There is a solid body of research regarding the effects of BCN programs. Most research examined timeliness of care and efficacy of care across the continuum of the breast cancer experience, and evidence of effectiveness of the BCN role in cancer survivorship.5,6,8,9,12 There remains a paucity of primary research specifically examining the role of the BCN in decreasing diagnosis-related distress through early intervention in the cancer care continuum. Hildegard Peplau’s Theory of Interpersonal Relations provides a framework for BCN intervention with this population, in the context of the Social Ecological Model (SEM).15,16 The SEM encompasses society, community, interpersonal, and individual levels of care. It is highly applicable to the impact of the BCN role on patient outcomes because of the dynamic, reciprocal interactions with persons and their environment. Within the individual level of the SEM, the 4 components of Peplau’s theory—Orientation, Identification, Exploitation, and Resolution—drive the goals of the BCN intervention.15 Three of Peplau’s constructs are met in the early meetings with the BCN: Orientation, Identification, and Exploitation. The Orientation phase defines the cause of the distress and demystifies the environment as the oncology journey is clarified and needed services are identified. During the Identification phase, the BCN and the patient focus on specific needs and together create a plan to support the patient’s goal of obtaining optimal emotional and physical health. Once the patient’s needs, goals, and a plan have been determined, the Exploitation phase is entered. Appropriate resources are accessed, understanding and respecting the patient’s cultural norms and boundaries. The fourth phase, Resolution, is the termination of the BCN/patient relationship and is met when the patient has achieved the stated goal and entered the posttreatment survivorship stage or end-of-life care.15 Figure 2 depicts our model of care using Peplau’s phases of the nurse/patient relationship and connecting those to the patient’s experience in the larger social ecological framework within which nurses and patients interact. The specific aim of this study was to examine the effect of an early intervention with a BCN on distress levels in newly diagnosed breast cancer patients. Although not a specific aim, a secondary interest was to examine effects of the BCN visit on the oncology practice at the institution. The study design used a preintervention/postintervention descriptive quantitative study with anecdotal commentary. It was hypothesized that this intervention would reduce distress levels in this population. The study received institutional review board approval from the institution of study and the collaborating university. Breast cancer patients newly diagnosed by radiological and tissue sampling at the facility were recruited through posters placed in the surgical providers’ office and exam rooms and near the main lobby of the cancer center. All patients seen by the BCN were offered the opportunity to participate in the study. Inclusion criteria included patients of any gender between 18 and 92 years of age who could speak and comprehend English, and who had seen a surgeon for a new diagnosis of breast cancer. Exclusion criteria included those unable to comprehend or speak English and individuals outside of the age limits or enrolled in care elsewhere. The intervention consisted of a single meeting with the BCN after the surgical consult and included education about their upcoming surgery and recovery, discussion of available resources, and emotional support. The BCN provided a private and comfortable meeting area to coordinate care needs. 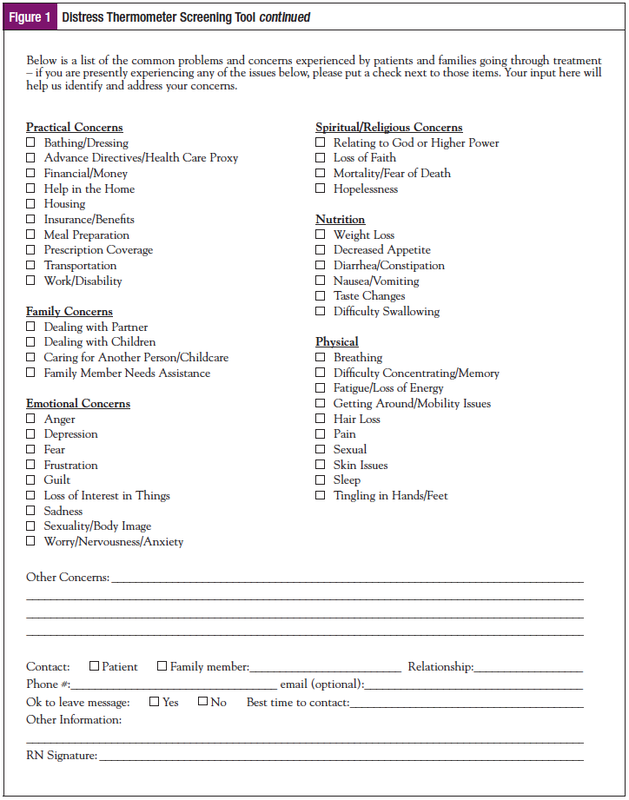 Patients completed a demographics form at enrollment. Immediately pre- and postintervention, participants completed the Distress Thermometer (Figure 1). This Likert-type scale corresponded to the level of distress patients felt. They were encouraged to share comments about the experience and the effect of being diagnosed with breast cancer, as well as the impact of the meeting with the BCN. Descriptive analysis was performed. Means of pre- and postintervention ratings on the Distress Thermometer are seen in Figure 3, which shows the consistent reduction in distress (N = 19). t test samples and paired samples analysis were performed (n = 18 due to missing data from 1 participant). A paired samples test was conducted to compare the difference between distress prior to the initial BCN intervention with distress immediately following the intervention. There was a statistically significant difference in scores between preintervention distress (M = 7.44, SD = 2.68) and postintervention distress (M = 2.94; SD = 1.86) conditions t (8) = 8.27 p-0.00. A paired sample correlation confirmed a significant correlation between the intervention and reduction in distress from preintervention to postintervention (C = .535; sig.022). These results suggest that the BCN intervention is effective in significantly reducing distress in newly diagnosed women with breast cancer. There was a fairly wide variance in reported distress on the scale prior to intervention, with consistent reduction in distress reported postintervention. Anecdotal comments offered during the BCN visit were sorted into categories, then into clusters of themes, and common themes were identified. Preintervention participants commented on feeling “stressed” and “alone.” Postintervention comments describe themes of feeling “less anxious,” “relief,” and “empowered” (see sidebar). Patients also shared comments aligned with the theme of “trust,” saying that the empathy and caring displayed by the BCN helped them to feel comfortable and valued. Although not originally part of the study, secondary analysis of retention rates of the population showed that it increased from 60% in the first quarter of 2017 to 96% over the last 3 quarters of the year (Table 2). The effect size (Cohen’s d = 1.79) was very large. Figure 4 shows a graphic of the increase in retention of patients for breast cancer care following implementation of this BCN study. These are very important findings for practice implications, especially when the sample size is small. The intervention reduced distress in this sample of newly diagnosed breast cancer patients. The standard deviation in distress varied quite widely preintervention but narrowed in the postintervention analysis, supporting the consistency of the positive effect of the BCN intervention on reduction in distress in newly diagnosed patients with breast cancer. This is in a rural area, and it is very possible that the widely varying reports of some lower levels of distress preintervention may have been impacted by the sense of stoicism and hardiness we often see in our rural patients. It is also possible that age-group affected self-report practices of patients. Although the sample size was small, statistical significance was achieved with correlations between preintervention distress and postintervention distress. The intervention results also drove practice change at the institution of study, and the large effect size of the data supports this finding. The BCN and members of an interprofessional team from several departments have developed a new system in which the BCN is now in contact with the newly diagnosed breast cancer patient within hours, instead of days, after they receive the diagnosis. The patient is offered a much more timely surgical consult appointment, generally within 24 to 48 hours after diagnosis. As a result, more patients are choosing to receive treatment at the institution. When patients live in a rural region such as ours, the impact of distant travel on cancer care can create a tremendous financial and emotional toll. Treatment pathways vary, but conservative Medicare reimbursement rates for the initial cost of cancer care for a breast cancer patient is $20,929.19 Given the increased retention rate for 2017, this could potentially increase revenue by over $500,000. The impact on the financial health of the institution could be significant, and, more importantly, this is in line with our vision to have patients receive the best care, closest to home. This was a well-designed quantitative research study using a validated tool for measurement. From a qualitative viewpoint, the study would be strengthened through a formal mixed methods design, with tape-recorded interviews and procedures. The sample size (N = 19) was small, as this was a pilot study. Limitations of the study include that it was a single-site descriptive study with distress measured at preintervention and at a single point postintervention rather than longitudinally. The study was conducted in a rural area, and the study sample was a homogeneous group of white females. These factors could impact generalizability of the results. However, the effect size was robust. This study was theory-driven; a larger sample size is needed to test the theory. Notably, results of this study consequently drove an immediate and positive practice change, well supported by the institution. The BCN program clearly decreased distress in patients in the study. Themes of emotional support emerged in a variety of domains, captured eloquently by patient commentary as well as survey results. This is important to understanding the value of the BCN role, because previous studies indicated that patients did not recognize the value of the BCN visit to their emotional health until much later in the continuum of cancer care.11 Peplau’s theory was an excellent choice to drive the interpersonal experience inherent in the BCN visit, and using the SEM supports the implications for practice, which go far beyond the reduction of distress.15,16 Use of theory in BCN practice is new to the institution; the current navigator chose the theory in consultation with the coauthor. Use of this model includes the need for education of future navigators in understanding its use in practice. A pivotal point in the initiative was the immediate institutional response to early findings with a supported practice change. Another outcome was institutional expansion of the program with the hire of a second BCN. There are plans to improve the current process, review the downstream effects of patient retention, and to create a similar process for other primary cancer-specific sites. Next steps include expanding the research to reach a more robust sample size that examines distress in a variety of domains. We also plan to examine the continuum of care and test our theoretical model. We would like to thank Tanya Cohn, PhD, MEd, RN, Assistant Professor of Practice, Simmons School of Nursing and Health Sciences, Simmons College, for statistical consultation. 1. American College of Surgeons. Commission on Cancer. Cancer Program Standards 2012: Ensuring Patient-Centered Care. www.facs.org/~/media/files/quality%20programs/cancer/coc/programstandards2012.ashx. Published 2012. Accessed February 20, 2018. 2. Taylor S, Harley C, Absolom K, et al. Breast cancer, sexuality, and intimacy: addressing the unmet need. Breast J. 2016;22:478-479. 3. National Comprehensive Cancer Network. NCCN Clinical Practice Guidelines in Oncology (NCCN Guidelines). Distress Management. Version 1.2018. www.nccn.org/professionals/physician_gls/default.aspx. Published 2018. Accessed February 21, 2018. 4. Mertz BG, Dunn-Henriksen AK, Kroman N, et al. The effects of individually tailored nurse navigation for patients with newly diagnosed breast cancer: a randomized pilot study. Acta Oncol. 2017;56:1682-1689. 5. Bukowski A, Gioia S, Chavarri-Guerra Y, et al. 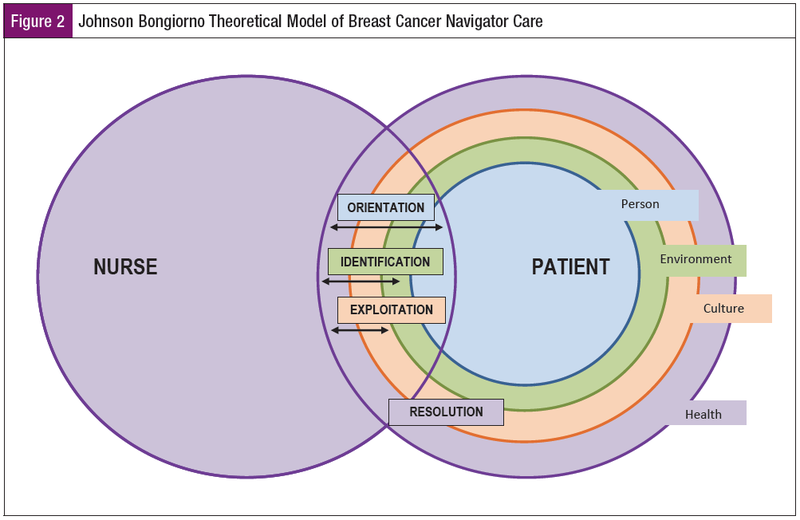 Patient navigation to improve access to breast cancer care in Brazil. J Glob Oncol. 2016;3:433-437. 6. Markossian TW, Calhoun EA. Are breast cancer navigation programs cost-effective? Evidence from the Chicago Cancer Navigation Project. Health Policy. 2011;99:52-59. 7. Weldon CB, Friedewald SM, Kulkarni SA, et al. Radiology as the point of cancer patient and care team engagement: applying the 4R model at a patient’s breast cancer care initiation. J Am Coll Radiol. 2016;13:1579-1589. 8. McKevitt E, Dingee C, Warburton R, et al. Patient navigation reduces time to care for patients with breast symptoms and abnormal screening mammograms [published online January 5, 2018]. Am J Surg. 9. Molina Y, Glassgow AE, Kim SJ, et al. Patient Navigation in Medically Underserved Areas study design: a trial with implications for efficacy, effect modification, and full continuum assessment. Contemp Clin Trials. 2017;53:29-35. 10. Rocque GB, Williams CP, Jones MI, et al. Healthcare utilization, Medicare spending, and sources of patient distress identified during implementation of a lay navigation program for older patients with breast cancer. Breast Cancer Res Treat. 2018;167:215-223. 11. Yosha AM, Carroll JK, Hendren S, et al. Patient navigation from the paired perspectives of cancer patients and navigators: a qualitative analysis. Patient Educ Couns. 2011;82:396-401. 12. Ahern T, Gardner A, Courtney M. Exploring patient support by breast care nurses and geographical residence as moderators of the unmet needs and self-efficacy of Australian women with breast cancer: results from a cross-sectional, nationwide survey. Eur J Oncol Nurs. 2016;23:72-80. 13. Horner K, Ludman EJ, McCorkle R, et al. An oncology nurse navigator program designed to eliminate gaps in early cancer care. Clin J Oncol Nurs. 2013;17:43-48. 14. Deckx L, van Abbema DL, van den Akker M, et al. A cohort study on the evolution of psychosocial problems in older patients with breast or colorectal cancer: comparison with younger cancer patients and older primary care patients without cancer. BMC Geriatr. 2015;15:79. 15. Petiprin A. Hildegard Peplau Theory. Nursing Theory. www.nursing-theory.org/theories-and-models/peplau-theory-of-interpersonal-relations.php. Published 2016. Accessed February 21, 2018. 16. Harvey VM, Oldfield CW, Chen JT, Eschbach K. Melanoma disparities among US Hispanics: use of the Social Ecological Model to contextualize reasons for inequitable outcomes and frame a research agenda. J Skin Cancer. 2016;2016:4635740. 17. United States Census Bureau. QuickFacts: Clinton County, New York; United States. www.census.gov/quickfacts/fact/dashboard/clintoncountynewyork,US/PST045217. Published 2017. Accessed February 21, 2018. 18. United States Census Bureau. QuickFacts: Essex County, New York; United States. www.census.gov/quickfacts/fact/dashboard/essexcountynewyork,clintoncountynewyork,US/PST045217. Published 2017. Accessed February 21, 2018. 19. American Cancer Society. Cancer and Medicare: A Chartbook. www.acscan.org/policy-resources/cancer-and-medicare-chartbook. Published February 1, 2009. Accessed February 21, 2018. Journal of Oncology Navigation & Survivorship. 2018;9:182-190.